The second annual Póc ar an Cnoic for the Edward Carson Memorial Trophy was an outstanding success again this year and I will post some photos over the next few days. 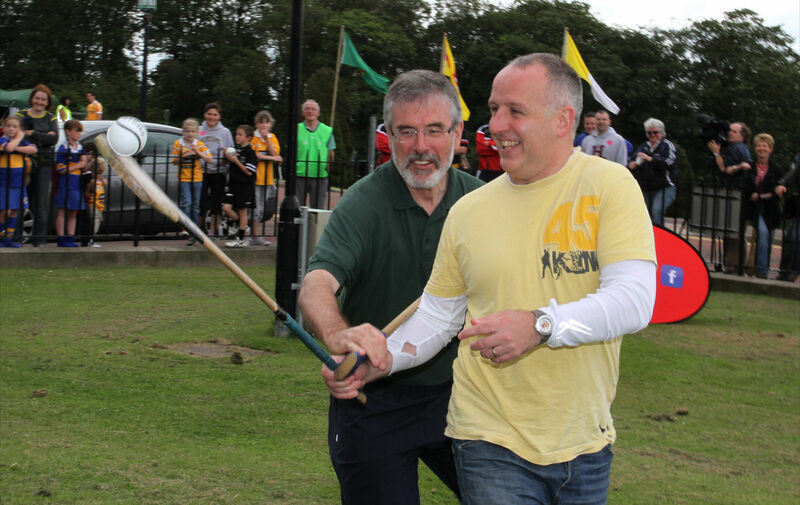 As regular readers of this blog, historians and hurling aficionados will know Unionist leader Carson was a hurler. He played for Trinity College away back in the day. And so, as part of Féile an Phobal, this blog and other atheletes gathered in the Stormont estate in the shadow of his famous statue Saturday. It was a mighty day of craic and sport. First off our young folks, camógs and hurlers battled in a series of very exciting games on the lawns in front of Parliament Buildings. Then a best out of two for the póc fada. Mark Sidebottom was defending his title from last year. Big Rogey – Martin Rogan heavy weight boxer – was obviously in training. Barry McIlduff obviously wasn’t. Neither was Mickey Brady. Or Lucilita Breatnach, Cathy Power or Madge McEldoone. Peter Bunting did well. And Dominic Bradley. This blog was robbed. I was ahead when Mark Sidebottom sidebottomed me. There was only a bounce of the ball in it. But sin é. There will be no sticking him now when he is commentating. Mr Two in a row. And then as Barry McIlduff said, before he fled to Croke to watch his son and Tír Éoghan and Baile Atha Cliath play in the national stadium, it was down to the serious business. This was the real long póc when a range of senior hurlers and camógs competed to see how many pócs it took them to cover the mile long avenue which is the main entrance into Stormont. 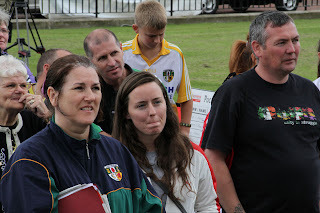 After a mighty battle Niall McManus from Rossa won the men’s event and Claire O Kane from Doire won for the women. Everyone had a great day out. Carson certainly would have approved. Our sponsors – O Neills, Martin Donnelly and Translink did a great job. So did all the stewards and mentors and every competitor. And the Poc Fada lads from the Cooleys. And the staff at Stormont. This blog sends special thanks to our good friend Paula Mac Manus who kept the whole thing going. She did a mighty bit of work. Comgheardas also to Kevin Gamble. 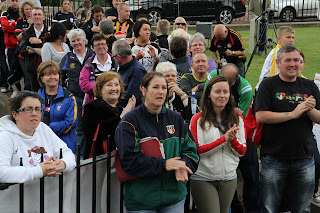 This was his first outing as Féile Director. And a very fine outing it was also. Well done to all the Feile team. Sounds like you had a póc-ing good time! Looking forwards to seeing your pictures. I do hope that Póc ar an Cnoic, had some great media interest. I for one, would enjoying viewing a video of this event. I was talking about a national healh and education program of national improvement fitness and performance in Irish lifestyle. I was reading on Cross-Training for Irish Dance and how this factor works. Improving skills that make them as an Irish dancer even more competitive and stress carriage. As music helps with rhythm and timing, as with Soccer helping with stamina, keeping feet quick and light, and turn-out of feet. Dribbling, passing, and kicking the ball. A national program that could create a everyday interest in Irish healh care seem relate our self image as Irish people. Good carriage, Stamina, Flexibility something basic for most people.